The “Logo” or “Brand” is the symbol or mark you use to represent yourself, your business and your products. It’s a pretty important part of your overall brand and it is worth taking some time to consider what you want before you begin working with a Graphic Designer. We strive to come up with practical logo designs that not only reflect our Clients but also are easy to use in a variety of applications. 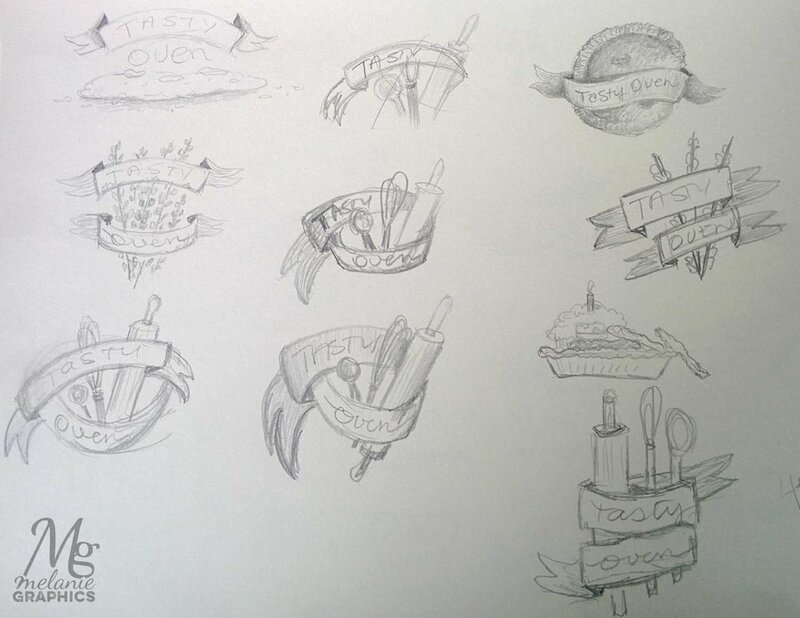 Here is an example of the process we took to get from no logo to a beautiful, creative logo for The Tasty Oven. Case Study: The Client originally came to us in need of a unique business card however after asking questions about her business goals, we suggested starting with a logo. The Tasty Oven is a new home-based business in Brantford Ontario who are looking to expand to sell their goods at local Farmer’s Markets. They make preserves, cakes, cookies, pies and more. If you are just starting your business, I'm sure that you have done some research into how to BRAND yourself. If you haven't, I'd suggest reading some articles to get yourself acquainted with the concept of branding. You don't have to follow all the advice you read but if something stands out to you and really makes sense, I'd consider adopting that as one of your priorities and share this with your graphic designer. Your Designer is likely going to ask you some questions about what you'd like. Questions like: 1) what is your WHY behind what you DO (Maybe this is one word or a few... Maybe it's "To Create Smiles", "To Encourage", "Independence", "Provide Help to Small Businesses". Mine is "To Create Beauty" or "Beautify the World Around Me"...the answer to the WHY question will likely answer the common "What Problem Do You Solve" question; 2) what FEELING do you want to convey to your potential clients with your logo? Ultimately, your Designer needs to understand the feeling the logo needs to give off. So while it’s okay to make suggestions of certain graphics and colours, also make sure to describe the feeling you're going for. 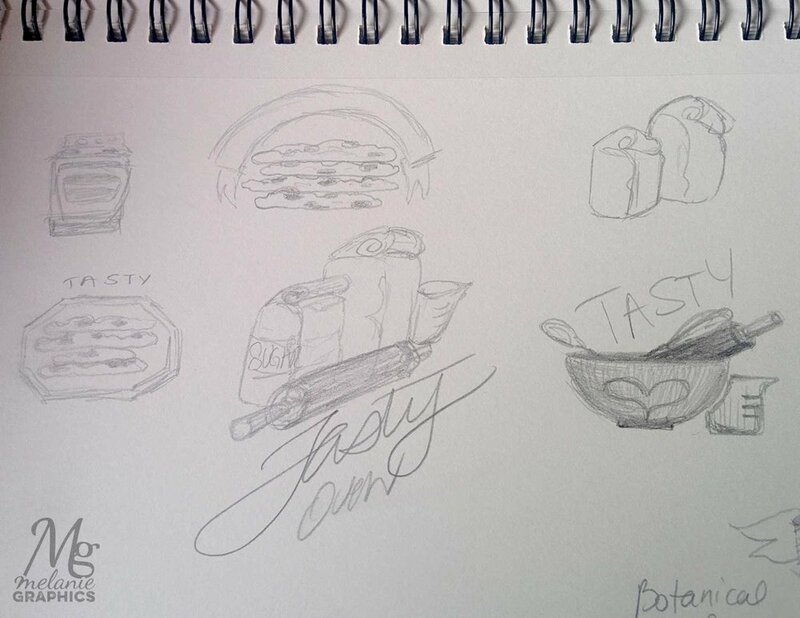 Starting off with pencil and paper allows a certain creativity to come to the surface that you don’t get if you just sit down at the computer. Once you’ve had a few ideas on paper, you try to make something similar in Adobe Illustrator. It’s almost always different than your hand drawn ideas but it gives you a great place to start. The computer really gives you speed and a finished quality that you’d never have doing it by hand. Ironically, a popular style now is to make things look hand-rendered. Isn’t that always the way? If you are considering creating your own logo or hiring someone, make sure that they can provide you with a vector file (ai or eps) which is created using Adobe Illustrator or Corel Draw. The reason this is important is that a vector is based on a scaleable math equation good for scaleability and being able to place onto anything without a white background. Vectors are also great for screen printing on tshirts. It is an expected file format that professional printers, sign makers and designers use. Also avoid ever using a photo within your logo. It is not scaleable and will make for a very large file. There are some concepts that we just don't show as it makes it harder for the Client to choose when there are too many options. We make every effort to show the very best options. The Client chooses their favourite logo concept and it’s time for tweaks. Sometimes, as was in this case below, the Client wants changes to more than one logo to help them decide (there is typically an extra fee for this but we’re happy to oblige). After all, your logo will be the face of your business for years to come. Once the client has chosen 1 favourite concept, we make tweaks to the colours, shapes or fonts and get it just right. In this stage, we will likely choose Pantone colours (if the client desires to have consistent colour when printing business cards, letterhead and more) Read more on this in our FAQs Printing section. By now, we have a chosen and finalized logo concept in the colours the Client prefers. Stage 3: Finalize Logo Files and Save in Various Formats for Client’s Use. Project Complete... stay tuned, we'll be showing the business card designs next!